Whatever the occasion; birthday party, hen night, stag do or even just a group of friends looking for the best night out, CLUB SWIZZLE promises to be the night you will never forget! GROUP OFFER: Buy 8 tickets for the price of 7 in the stalls or rear stalls. The creators of LA SOIRÉE return to London with their brand new show! 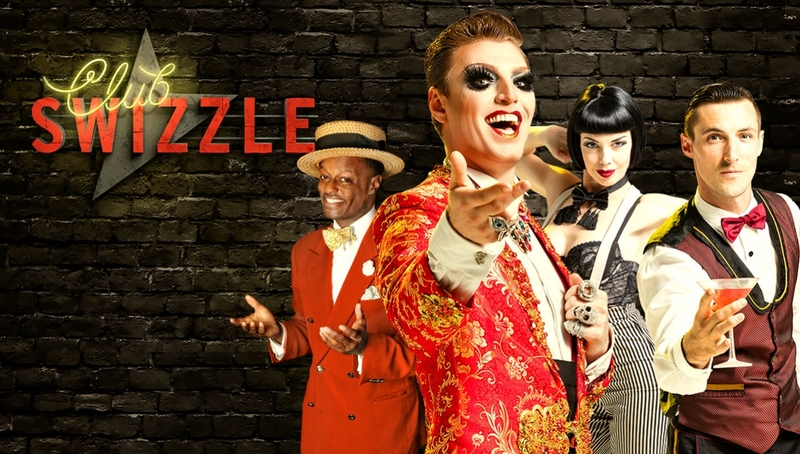 Loose, glorious and irresistibly fun, Club Swizzle is a night of sassy entertainment at the wildest bar in town. Cabaret sensation Reuben Kaye hangs on to the reins of chaos while the charismatic Swizzle Boys shake things up behind and on top of the bar. It’s a melee of outrageous cabaret, air-defying acrobatics and infectious musical revelry, backed by a LIVE BAND with a repertoire as big as its bar tab. Featuring Dandy Wellington, Laurie Hagen, Yammel Rodriguez and more. Take your seats for the hottest show of the summer, while staying cool in our deliciously chilled Brick Big Top! Come down early and join us at the bar where the cheeky Club Swizzle troupe is on hand to mingle and serve up cocktails with a wink and a smile. When the band starts, the bar will transform into the stage – it’s show time! Check the Essential Info section for opening times. Tickets: popular shows may go up in price, so book early to avoid disappointment! VIP tickets: Secure your seat at a cabaret table with a drink on arrival and table service throughout the show. Call our box office on 0300 6789 222 to book for groups of over 9. Our Roundhouse bars are open all evening. Doors to Club Swizzle open 30 mins before the show. Doors will open at 9.30pm, with time before the show begins to enjoy the Roundhouse bars. Back by popular demand, the-recipe, will be taking up residency in our kitchen! With restaurant meals for all and platters for Club Swizzle VIP ticket bookers. Groups get 10% off the whole bill (food and drinks) for tables of 8 or more. Subject to booking a table and purchase of 1 main course per person. Click here for information and to book.